@mkotowski1: Nylon 6 (which is what the majority of these pedals are made from) is extremely recyclable. There's a solid chance the pellets that became a pedal were originally commercial carpeting, for example. We are cleaning out our spare parts closet, and this fork is in need of a new home. This fork has light mileage, and is in great shape. There is no damage to the stanchions, and only minor scuffs to the stickers on the lowers. The fork is coil sprung with the standard spring installed, and has the HLR damper with adjustable rebound and high- and low-speed compression. 200mm of travel, with a 20mm thru-axle. Steerer tube is cut to 6 1/8", so double check this will fit your frame. Credit card preferred, buyer pays shipping. 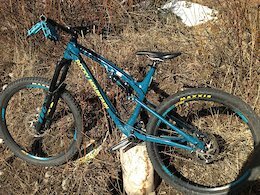 We are cleaning out our spare parts closet, and have this XL Rocky Mountain Slayer carbon frame in need of a new home. 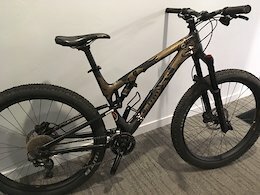 This bike has one season of use under its belt, and includes the RockShox Deluxe RT rear shock, rear axle, seat clamp, and headset. There are some minor cosmetic scratches and chips to the paint, see photos for details. There is no structural damage to the frame, and all pivot bearings spin smoothly. Credit card preferred, buyer pays shipping via BikeFlights. Cleaning out our spare parts bin at the end of the summer season. This fork has moderate use (ridden approximately 25 times) and is in excellent mechanical condition. There are no scratches to the stanchions, and all adjustments function as intended. We even refreshed the decals with a fresh kit. Boost spacing 15x110mm axle, steerer tube is 8 3/4" long. Credit card preferred, buyer pays shipping via BikeFlights. We have a couple spare forks from our rental fleet that need a new home. This X-Fusion Sweep RL2 has light use, is 140mm travel (internally adjustable 120-160mm), and uses a 15x100mm axle. The steerer tube is 7 3/8" long. Credit card preferred, buyer pays shipping. Feel free to call with any questions! 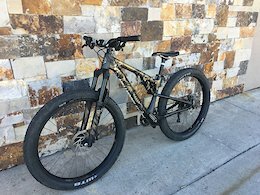 We have a couple spare forks from our rental fleet that need a new home. This Manitou Mattoc Comp has light use, is 160mm travel, and uses a 15x100mm axle. The steerer tube is 7 3/4" long. Credit card preferred, buyer pays shipping. Feel free to call with any questions!